If you own an older building, wired before the 1960s, chances are you have knob and tube wiring behind your walls. As safer, more efficient and more effective wiring methods have been introduced, these systems are being widely replaced; today, you’re just as likely to find knob and tube materials in antique stores as you are in residential and commercial structures. Why should property owners consider upgrading? There are several reasons. There are two major components to the knob and tube system, as the name suggests. Porcelain knobs are screwed into the wood and used to support an individual wire. In places where the wire travels through an obstacle (such as a stud or wall), an electrician would install a porcelain tube and snake the wire through. Knob and tube was the standard electrical wiring method from the 1880s to the late 1950s. When first introduced, it was the economical choice. The other option then was to use conduit systems with armored cable and metal junction boxes, but the cost for the cable was twice that of knob and tube. Because of its budget-friendly nature, electricians continued to use knob and tube in new construction, even as late as the 1970s. It’s inflexible. Knob and tube is like a giant spider web. 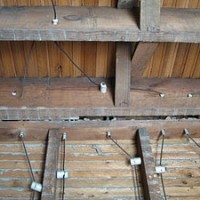 Usually, there’s a main run through the attic, and from there, wiring is tapped off throughout the rest of the house. Should you want to move a wall (for example, to create a door), moving the knob and tube wiring can be exceedingly difficult: one wire could be supporting the rest of the house. It’s often modified incorrectly. Whether it’s a bad splice or a homeowner who thought they could handle repairs to the “simple” knob and tube system, it’s common to see improper and unsafe modifications. It can’t handle today’s electrical requirements. Knob and tube was adequate for the previous generation’s electrical needs, but today’s consumers use much higher loads than this wiring system was designed for. It’s easy to overload the system. In these systems, there typically aren’t many circuits. You might have an apartment, for instance, that has just one or two circuits, which can cause fuses to blow frequently. To compensate for the inconvenience, some people put a penny in there to short it out so the fuse no longer trips, which is extremely dangerous. This maneuver can overload the wire and create a potential fire hazard. Insurance companies don’t like it. Often, homeowners install larger fuses because they’re frustrated from them blowing all the time. This creates potentially unsafe conditions. Some insurance companies won’t underwrite policies in structures with knob and tube, while others charge a fortune. Anecdotal evidence suggests that homeowners can recoup the cost of rewiring within a few years as they save on insurance premiums. Knob and tube still functions, and if the components and wiring are in good condition, they are generally safe when used properly. The problem is that it is easy to demand too much of these antiquated systems, overload them and create unsafe modifications. Upgrading will deliver more efficiency, higher capacity, improved safety and increased peace of mind. Why Does My New Appliance Have a 4-Pronged Plug? At All Wire Electric, we believe success is built on a foundation of honesty, integrity and value. *All labor and material are covered by a 1-year warranty.